Among all types of passenger cars, sedan is one of the most stylish forms. A sedan car has a three-box configuration with separate compartments for engine, passenger and cargo and four doors that means there is no way to get inside the car through the trunk. Such types of cars are also known as saloon cars. Almost all top makes of India have brainstormed enough to come up with some best models in the sedan category. Honda Amaze launch date in India is April 2013 with four variants- E, EX, S and VX. In 2014, another trim variant launched was SX. Then, Privilege Edition was launched in 2017 and in 2018 Pride Edition was launched. There are 14 different variants and their prices range from Rs. 5 lakhs to Rs. 10 lakhs. Honda Amaze diesel variant price starts from Rs. 6.90 lakhs and the petrol variant start from Rs. 5.80 lakhs. The petrol variant Honda Amaze has 1.2L i-VTEC engine, 90 ps power, mileage of 19.5 km/l and manual transmission. And diesel engine has 1.5L i-DTEC technology engine, 100 ps power, 27.4 km/l mileage, and manual transmission. The latest subcompact sedan model has been tagged as the ‘Sedan of the year’. Earlier over these years, the car has always been on the wish list of many. The car runs well on highways as well as on city roads with traffic and remains stable with or without full load passengers. As of now, 5 colours are available in Honda Amaze. Those are Lunar Silver, Radiant Red, Golden Brown Metallic, Orchid White Pearl, and Modern Steel Metallic. Initially, Hyundai Verna was launched in the year 2005 and continued at a stretch till 2010. Then from 2010 to 2011, Hyundai Verna Transform existed. Again from 2011, Hyundai Verna has prevailed in the market. The price of the car ranges from Rs. 8.08 – Rs. 14.04 lakhs. There are thirteen variants of Hyundai Verna, and their price varies as per the engine power, mileage and transmission. The petrol variant cars’ prices start from Rs. 8.08 lakhs, whereas the diesel one starts from Rs. 9.33 lakhs. Hyundai Verna SX is one of the most famous variants among all other types. The five-seating car has its key specifications as engine 1582 cc to 1591 cc and transmission both manual and automatic are available in different variants. The car has gearboxes of 6-speed with FWD and power steering. Hyundai Verna mileage ranges from 16.66 to 24.75 kmpl. Most of the users have rated this car as 5-star car and mentioned the car is great for chilling on highways and long trips and involve less maintenance cost. Over the years, 3.18 lakh units have been sold in India and 8.8 million worldwide, in spite of Hyundai Verna 2019 is equally popular and in demand. The colour variants available are Fiery Red, Stardust, Polar White, Siena Brown, Phantom Black, Typhoon Silver, and Marina Blue. All these variants are equally attractive and eye-catching. Maruti Suzuki Dzire is a subcompact sedan car that was first launched in 2008 in the Indian market. Since then it has gained enormous popularity and launched the third generation of the car on 16 May 2017. The price of the car ranges from Rs. 5.69 lakhs to Rs. 9.54 lakhs. The petrol variant of Suzuki Dzire starts from Rs. 5.69 lakhs and diesel variant from Rs. 6.67 lakhs. There are fourteen different variants of Suzuki Dzire and their prices vary as per the engine cc, engine type and mileage. The key specifications of the car include mileage 22 kmpl, engine 1197 cc, manual transmission, fuel type both petrol and diesel are available, boot space is 378-liters, power windows both in front and rear, airbags available for driver and passenger, ABS and central locking are also offered. The car always gets a thumbs up for its practicality, equipment and the quality of interiors. It has only one con of limited rear headroom. Otherwise, it is a feature rich compact sedan. The colour variants of Maruti Suzuki Dzire are Silky Silver, Sherwood Brown, Pearl Arctic White, Oxford Blue, Magnum Grey and Gallant Red. Honda City is a subcompact car was launched in 1981. But, with the third generation of Honda City car, it started the journey in the Indian market since 1998. Currently, there are eleven variants of Honda City car available in India and their prices range from Rs. 9.91 lakhs to Rs. 14.29 lakhs. These are all ex-showroom price, so if you want to know the Honda City on road price, you can add around 10% extra to the above-mentioned price to estimate how much you have to pay to own the car. The key specifications that you will find in all Honda City 2019 are mileage between 17.4 and 25.6 kmpl, engine 1497 to 1498 cc and transmission either manual or automatic. The diesel variant has 99 bhp @ 3600 rpm power and its petrol variant has 117 bhp @ 6600 rpm power. Though most users consider Honda city as a great car in terms of looks and experience on city roads and highways, some reviewed it as a nightmare on rough roads. The car gets 4.5 stars in looks, performance, space and comfort and 3.5 stars in fuel economy and value for money. As of now, five colour options are available in the market, those are, White Orchid Pearl, Golden Brown Metallic, Modern Steel Metallic, Radiant Red Metallic, and Lunar Silver Metallic. Since 2014, Maruti Suzuki Ciaz cars are available in India and in 2017, it launched a new sporty variant Ciaz S.
The price ranges Rs. 8.19 Lakhs upto Rs. 11.02 Lakhs, where the petrol Ciaz price starts Rs. 8.19 Lakhs and diesel Ciaz price from Rs. 9.19 Lakhs. The main features of the car are its mileage ranges from 20.28 to 28.09 kmpl and engine from 1248 cc to 1462 cc. The petrol variant of the car has 103 bhp @ 6000 rpm power. The car gets 4.5 rating in all the parameters- looks, performance, space, comfort, fuel efficiency and value for money. Users usually feel proud to be an owner of Ciaz car and consider it as a perfect family car. Maruti Suzuki Ciaz colour variants are Pearl Metallic Dignity Brown, Pearl Midnight Black, Metallic Premium Silver, Pearl Snow White, Metallic Magma Gray, Nexa Blue and Pearl Sangria Red. 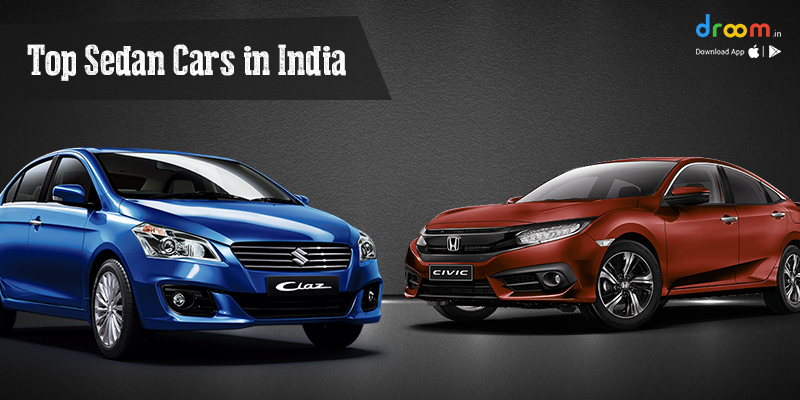 The list of top sedan cars in India can never end with only 5 cars. There are so many in the list and they deserve equal appreciation as any of these mentioned above. Some other popular sedan cars are Toyata Platinum Etios, Skoda Rapid, Honda CIVIC, Skoda Octavia, Mercedes-Benz CLA, Tata Tigor, Toyata Yaris, Hyundai Xcent, and many more.